Kilimanjaro treks are a huge industry, with over 40,000 people signing up for the challenge each year. With such a demand, there are literally hundreds of operators offering climbs, and each fighting for a share of the market. These outfits vary from one man bands, through mid-size high-end ground handlers and the biggest operators who squeeze every shilling to maximise profit. It is a minefield and we rightly receive lots of questions from prospective clients. With Monix, the journey starts with a face to face meeting where we fine tune ideas and talk prospective summiteers through each of the routes and packages on offer. As the planning progresses and the team takes shape, we run a briefing evening and kit check which is invaluable in ensuring you feel completely prepared for the challenge. We can also offer training hikes in the mountains by arrangement for those who want a proper shakedown or for teams who wish to get to know each other better before the climb. From the moment you touch down in Tanzania, our team will welcome you with open arms and look after you for the entire journey. We mount our expeditions from a handpicked selection of luxury lodges and hotels around Arusha and find it to be the perfect launchpad for climbs on both Kilimanjaro and nearby Mount Meru. Our network of highly trained Tanzanian mountain guides are employed permanently and have all passed extensive training in mountaineering and wilderness first aid. During the low season, they also participate in additional seminars on flora and fauna, HIV awareness, English lessons and environmental protection. This means we have one of the best trained and highly motivated teams on the mountain and can deliver safe and memorable expeditions. We have been climbing Kilimanjaro since 2003 and have developed an intimate knowledge of the mountain. Between ourselves and our network of guides, we have climbed every trekking route and even some of the technical routes. This in depth knowledge, combined with our enthusiasm and expertise means we can build the perfect Kili trip. The abuse of porters on Kilimanjaro is worryingly widespread and sadly it is these men who often bear the brunt of cost cutting by operators. They may be overloaded, poorly equipped, badly fed and under paid. When you see them carrying all of your kit, you would feel ashamed if you thought they were not being fairly rewarded for their incredible hard work. It’s common to see porters sat on a blanket at 10pm shivering outside. This is to save weight and cost of porters, they sleep in the clients dining tent, and therefore have to wait until all the clients have gone to bed before they can sleep or even have some shelter. Also, some of the companies will agree a basic wage for porters, and then deduct food and shelter from that. There is an organisation in place called the Kilimanjaro Porters Assistance Project (KPAP). They have produced a basic criteria for partner climbing companies to sign up to, which covers things like minimum wages, equipment provided etc. Monix is a full member. The single most important aspect of any expedition. Climbing Kilimanjaro, whilst not technical, will expose you to extreme altitude and a relatively fast ascent. We don’t run any climbs of less than 7 days, and to save a few dollars by shaving off a day is a false economy. You could count on feeling lousy all summit day, and at worst become very (i.e critically) ill with altitude related illness. Make sure your operator carries bottled oxygen, pulse oximeters, a portable altitude chamber, a comprehensive first aid kit (with trained Guides) and also radios. We do all of this and during the low season our Guides are put through wilderness medical training. Our guides are internationally certified first aid responders. All of our porters are also first aid trained. In such a competitive market, many operators will simply try to offer treks at the lowest price. Clearly, this will always mean compromise, and sadly the knock on effect of this can be dire. Climbing Kili should be a trip of a lifetime, and saving a few hundred pounds may see you sleeping in leaky tents, eating bad food, halving your chance of summiting, violation of the basic human rights of your porters, and very poor medical/ emergency back up. Sleeping well and being comfortable can make or break your trip. On Kilimanjaro itself, we can provide a full spectrum of different services, from our standard tours to luxury ascents. We will work with you to build a trip that offers exactly the level of comfort you’re after. Our standard tours are better equipped than 80% of the other teams on the mountain, with top quality tents, private toilet tents and a high ratio of Guides and porters to avoid over loading. Our luxury specification adds an enhanced menu, foam mattresses, pillows and large four person tents for every two trekkers. We also offer a unique flagship specification which is unlike anything else offered on the mountain. Our guests will enjoy standing height sleeping tents, full size aluminium cot beds with mattresses, pillows, blankets, solar lighting, four course meals, a private shower tent and a 1:1 ratio of Guide:Trekker on summit night. We believe it’s the best product on the market, and combined with our unique experience of climbing the mountain so many times, we are confident that teams will have not only the best chance of reaching the summit, but also the most enjoyment long the way. Our porters also sleep in their own tents, so they can shelter and rest as soon as they arrive at camp. Day 1: Arrive Tanzania to be transferred to accommodation for briefing and day at leisure. After breakfast at the hotel, you’ll meet your local guides, who will come with you on the mountain. It’s a three-hour drive from Arusha to the Londorossi Park Gate where you’ll register to enter the Kilimanjaro Park, before finally getting your boots on to start climbing Kilimanjaro. You should reach your camp in the forest at Mti Mkubwa after approximately 3-4hrs. Today is a fairly full day’s walk, and you will leave the forest zone beneath you as you gain height and reach high moorland and a desert-like environment. The trek should take around 5 hours. After breakfast, you continue to hike east across the Shira Plateau and take in the spectacular views south across the plains and towards Mount Meru. (4hours). Although on paper you only finish your trek 100m higher than the previous night, you will have ascended all the way up to 4600m, at Lava Tower, before winding your way back down the valley into Barranco Camp. This is an important day for acclimatisation and you will have a leisurely lunch at Lava Tower and let your bodies adapt to the thinner air. (7-8hours). After breakfast, your first challenge is to climb the Barranco Wall, which will have looked impenetrable on the approach, but don’t worry, it’s not as hard or as steep as it looks! You’ll be on top of the 200m wall in no time, and will then continue eastwards to the Karanga Camp (4 to 5 hours). From Karanga Camp a 3-hour walk takes you to Barafu Camp from where you will make your summit attempt. After an early supper you will go to bed with palpable excitement and apprehension, ready for the 11pm wake up call. (3hours). You will leave camp around Midnight to climb through the darkness. You should reach the Crater Rim around 6am, watching the sky over your right shoulder turn through amazing shades of orange to deep blue. 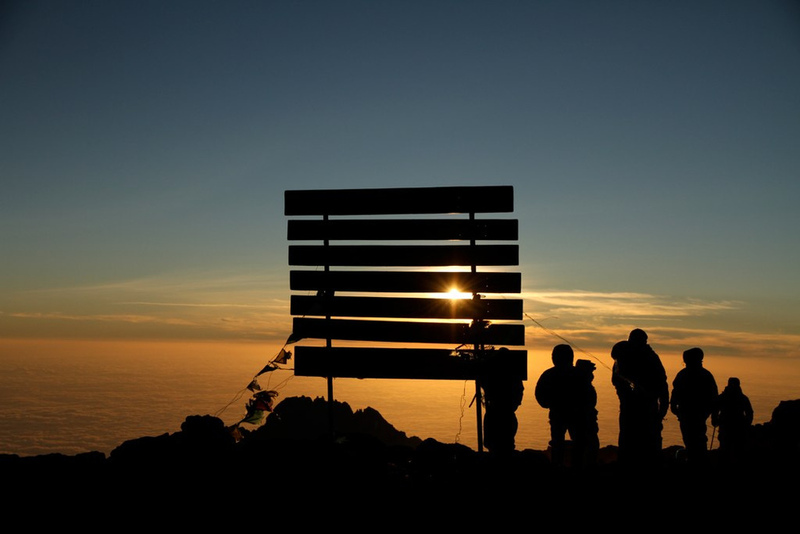 Shortly the large green sign will appear in your line of sight, and energised by seeing the summit you can huddle together on top to take photos, and enjoy the spectacular views from the “Roof of Africa”, before descending to Mweka Camp for the evening. Day 9: Mweka Hut to Mweka Gate to Arusha. In the morning, you’ll take the easy walk down to Mweka Gate. At the Park Gate you will say goodbye to your porters and tip them in return for all of their help throughout the expedition. You will be transferred back to your accommodation, for a well earned celebration dinner followed by a great night’s sleep. We offer three standards of trip: Lightline, Highline and Skyline. We can say with confidence that even our Lightline offering is better equipped than 80% of other expeditions on the mountain. Our Highline climb includes several refinements to enhance the comfort, and our Skyline spec is the only service of it’s kind. Safety remains the key focus regardless of specification chosen. Highline Specification: A large mess tent is provided for dining, with high-backed chairs. A larger sleeping tent with a 3 inch foam mattress, pillow and -18 Celcius rated sleeping bag with liner. There is a private portable toilet. 3 course evening meals and fresh pressed coffee available. Diagram below shows tent dimensions but will only have 2 persons in each tent. Skyline Specification: As per the Highline specification but with a larger standing height tent with a full size sleeping cot so that guests are raised above the ground. A shower tent is also included and so too is an enhanced menu. We also add small heaters, solar charging facilities, and a 1:1 Guide ratio. This is the most comfortable all inclusive specification on Kilimanjaro. We work with a number of beautiful lodges and hotels around Kilimanjaro to make sure that the experience doesn’t just start and end on the mountain. From Mount Meru Hotel to Lake Duluti Lodge, we’re confident you will find an expedition with us comfortable from the moment you arrive.